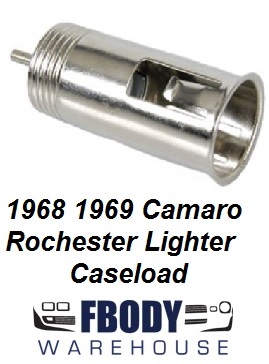 For use on 1968 1969 Camaro This is a new cigarette lighter caseload, Rochester.brand.Fbodywareouse offers all of the cigarette light parts you will need to get your Camaro back to new! High quality reproduction of original Rochester style dash lighter recptacle (caseload). Correct pin style power lead attachment. For use on 1968 and 1969 Camaro models.